Food: By diving and catching fish in waters up to 25 ft. deep. The Double-crested Cormorant is a large, greenish-black waterbird with a slender hooked-tip bill, orange facial skin, and webbed feet set well back on its body. It is named for the two small tufts of feathers on either side of its head, which appear on the adults in spring plumage. The bird can frequently be observed standing erect on rocks or posts, sometimes in a spread-eagle posture; or swimming low in the water, often with only its head and neck exposed. On the water, it can be distinguished from loons by the distinct upward angle of its head and bill. Flocks often fly in "V" formations similar to geese. This behavior and their general coloring likely led to cormorants being called "crow-ducks" by early European settlers. The Cormorant call is a deep guttural grunt. Hear It Now! There are about 30 species of cormorant worldwide, including six in North America, of which the Double-crested Cormorant is the most common and widespread, and the only species which is commonly seen inland around bodies of fresh water. In the Great Lakes region, the population of the Double-crested Cormorant showed an initial 30-year period of colonization (1920s - 1950s) followed by a 20-year decline (1950s - 1970s) and, most recently, a spectacular 20-year resurgence (1970s - 1990s). The significant 20 year decline is largely due to the effects of toxic chemicals used during that period, specifically DDT. 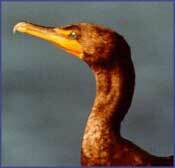 Over the past 25 years the cormorant population has increased tremendously to almost alarming rates. Many fish-eating birds, like cormorants and shags in particular, arouse suspicion and even hostility among fish harvesters, who believe that these birds reduce the numbers of commercially and recreationally valuable fish. There is also concern about the effect of cormorants on the vegetation in their nesting grounds. Cormorants can damage vegetation by stripping leaves from trees. The combined weight of the birds and their nests can even break branches. But perhaps most importantly, their excrement, which rains down to the ground from their nests, kills the ground vegetation and eventually kills the nest tree. In some cases, the loss of these trees can lead to increased erosion. A range of measures can be employed to reduce the impact of predation by cormorants ans shags, but their effect will vary from one location to another. Disturbance by people is consistently effective, and visual or noise deterrents are most likely to work on still waters. These methods are less likely to be useful or effective on rivers. Visual decoys like Gator Guard can be used to protect koi ponds and fisheries. Flock Reflector is very effective in keeping large water birds away from boats and docks. Porfessional fish and shrimp farms commonly use complete bird exlusion by placing Premium Bird Netting over the water. See our complete list below of recommended bird deterrent products to repel Cormorants and Shags. A "synergy" or combination of bird repellent products typically offer the most successful solution for repelling Cormorants and Shags. For bird control solutions, we often recommend using companion products by combining electronic sonic repeller devices or bird hazers with visual scare deterrents, physical bird barriers or scent and taste aversion products. This kind of multi-sensory attack is extremely effective in deterring pest Cormorants for good!